6+ tastings, sips and bites – includes a bottle of water, cultural stops, vendor demonstrations and much more! Enjoy Montreal and the Mile End’s quintessential foods, including St. Viateur bagels! Delight in some treats at Montreal's most popular bakery. Why take the Mile End Montreal Food Tour? Mile End is a thriving community of musicians, artists and young entrepreneurs. Our tour allows you to discover exactly what makes this special neighbourhood tick! We explore its back alleys, acclaimed shops, and exhilarating culture. Not to mention, you'll also uncover some of Montreal’s most unique, tasty, and trendy food. Whether you’re from distant lands or a local Montrealer, this tour is the perfect way to dive into the city's culture, spend time with friends or coworkers, and it makes for a perfect gift, too. 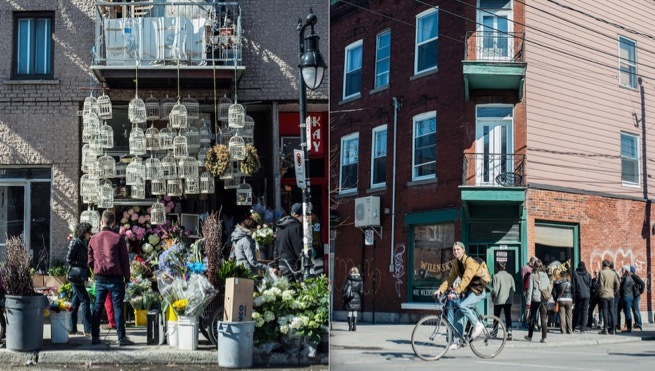 Together, let’s discover why the Mile End is the fastest-growing neighbourhood in Montreal! 1. La Panthère Verte - We meet at the famous sustainable Green Panther vegan eatery. Our journey starts with what has been voted “Montreal's best falafel”. 2. 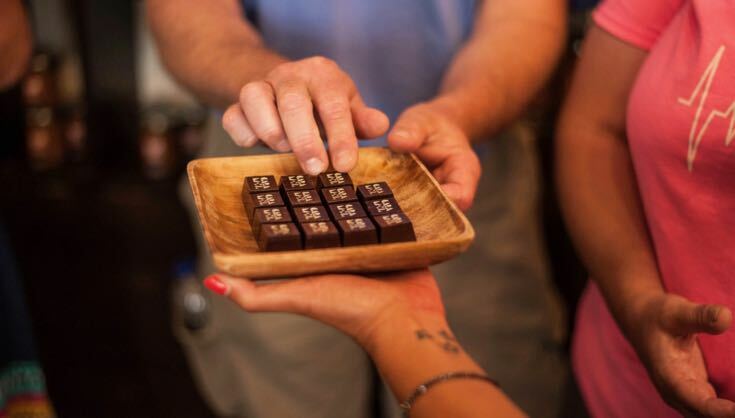 Chocolats Geneviève Grandbois - Together we savour Montreal's most lovingly produced chocolate for an epic dessert! 3. St. Viateur Bagel (Est. 1957) - We enjoy famous Montreal bagels while arguing whether they truly are “the world's best bagels”. 4. Drogheria Fine - We savour fresh homemade gnocchi with Montreal's best tomato sauce, served by the owner himself! 5. Boucherie Lawrence - A neighbourhood butcher shop offering specialty charcuterie, as well as meat that has been raised locally and humanely. 6. Boulangerie Chez Guillaume - Finish off your tour with some delicious local pastry from one of the city's most beloved bakery. What to expect from the Mile End Montreal Food Tour? One-of-a-Kind Food Tasting — On our 3-hour guided tour of the Mile End neighbourhood, we visit six unique tasting locations. Each one ensures that you will enjoy fresh and exciting flavours. We sample a variety of food from the Mile End, including everything from decadent Québécois chocolates to fresh homemade tomato sauce. The food samples included are enough for a hearty and satisfying lunch. Our tasting locations range from an ambitious urban butcher, to the famous St.Viateur bagel, and even to a fully sustainable vegan eatery! All food tastings are included in the ticket price. We even throw in a water bottle to keep you hydrated. Historic & Cultural Experience – As you take in the eclectic streets of the Mile End, you’ll get the chance to experience life as a native Montrealer, or should we say a native “Mile-Ender.” Our knowledgeable tour guides highlight the fascinating and offbeat history of this rich cultural hub. Our tour presents how the Mile End became home to the most artists per capita in all of North America (seriously). We also discuss the historical and cultural significance of many landmarks found in the bustling sector. The Mile End has become the epitome of Montreal’s multicultural standard, and our tour touches upon the deep history of immigration and settlement embedded in these streets. We can guarantee it will be the most interesting stroll you’ve taken in a while! In addition to this, our enthusiastic local guides share their knowledge, recommendations, and personal anecdotes about how the Mile End became the intriguing neighbourhood it is today! Runs rain or shine, snow or even in extreme snowstorms! (40% of the tour takes place indoors). We highly recommend you bring appropriate clothing for the winter season and sun protection in the summer. Please note that the Mile End Food Tour includes vegan and gluten-free options during the summer season. In the winter we offer reduced ticket prices for those requiring such dietary restrictions as a result of the reduced quantity of food. We invite those who are gluten intolerant to join our Old Montreal Food Tour, which features a shop specializing in gluten-free foods. If you’re an early bird, we suggest you have a small breakfast before coming. If not, you can also skip your breakfast and come directly to the food tour. Tickets must be purchased before 10 AM on any given tour date. We recommend booking your tickets in advance as most of the tours tend to sell out. Avoid driving to Mile End at all costs. Parking is almost impossible to find. If you need to come by car, we recommend that you find parking in another neighbourhood and take public transit. WHAT IS THE DIFFERENCE BETWEEN THE EVENING AND DAY TOUR IN THE MILE END? Both tours are amazing in their own way. We offer both tours to make it easier for guests to fit our food tour into their schedule. 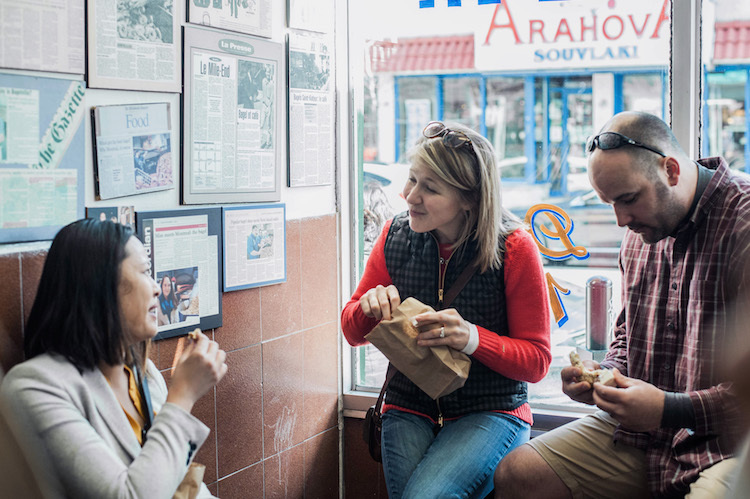 The Mile End Food Tour (daytime) is longer and takes guests into the historic Rialto Theatre, Lawrence butcher shop which features locally-raised meat, and a few other hidden gems. The Evening Mile End Tour invites guests to experience the neighbourhood’s urban evening culture when the streets come alive. This tour is shorter, but still incorporates all the delicious food stops that’ll leave you full and satisfied. We even throw in a craft beer sample to kick off your evening!